I was never a reader when I was in school, as were many of my peers. Even my granddaughter Gretchen read more books than I ever did. As time went on my husband and I were able to take some trips-and in that bit of leisurely time I started to read a few books. Luckily, I happened upon a couple of good ones that held my very short span of interest. I was hooked I think magic happens when you realize how much you are missing after a good book experience. 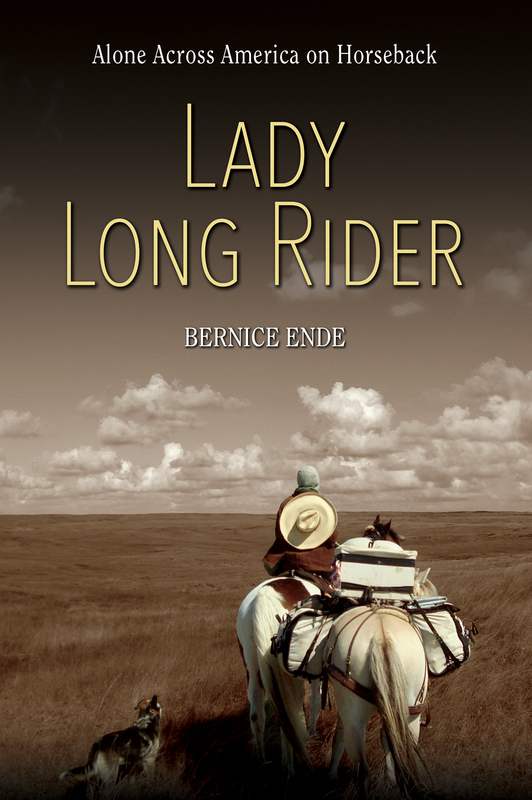 If you are not a reader, but love horses, (or are a reader), I believe you will have one of those magical moments when you read ‘Lady Long Rider’ by Bernice Ende. I encourage you to pick up this inspiring true life book. To me the essence of what we do with our horses is all about the time spent- time spent riding, time exchanging our spirits with our horses and time spent building trust. If you walk into Ms Ende’s world through her book, you will find a woman that is not only beautiful in character and grace but beautiful in engaging her devotion to her horses. She fulfills her authentic individual ambition. Unlike others, she is truly a Lady Long Rider. In her earlier years, Ms Ende was meshing horses and ballet not even realizing how this would situate her for what was ahead in her life. After seeing the Lipizzaners that performed in Minneapolis, she became intrigued by the graceful and strong dressage movements by the horses. She would take the two very unparalleled disciplines,(ballet and riding), and later lay them side by side to emerge into a greater feat that has not ever been recorded. Let alone by a woman. At the young age of 50, Ms Ende brings to fruition a vision of riding a horse, that she did not recognize. This vision lead her to a desire to ride to visit her sister. Not just a few blocks away or a few miles away, but from her home in northwest Montana to her sisters home at Edgewater, near Albuquerque, New Mexico – 2,000 miles away! Ms Ende’s story, will captivate any rider to not want to put her book down, unless it is time to feed the horses (a must as horse owners :). Earning the right to be a member of the Long Rider Guild -any one whole ride that is 1000 miles long, Ms Ende surpasses this distance. But you will have to read her book to find out just how far she travels and how she handles each days adventures along the way. It is a privilege to think that we can follow Ms Ende on her face book page, Lady Long Rider-Bernice Ende, and see her in her travels. Her experiences are not always easy, sometimes lonely and very difficult. But her beautiful spirit is tenacious, strong and unparalleled. As Ms Ende states, “There are many reasons why I ride, here are four: to encourage female leadership, to discover, learn and grow. If something sounds good to you, don’t let your fears stop you from latching on to that compelling notion of going and doing.” Well said Ms Ende! Truth or Consequences, how ever did you get this name? ….from Wikipedia, “Originally named Hot Springs, the city changed its name to Truth or Consequences, the title of a popular NBC Radio program of the 1950’s. Ralph Edwards, the host of the radio quiz show announced that he would air the program on its 10th anniversary from the first town that renamed itself after the show; Hot Springs won the honor, officially changing its name on March 31, 1950 (the program broadcast from there the following evening, April 1.) Edwards visited the town during the first weekend of May for the next 50 years. There are at least a dozen hot spring spas in Truth or Consequences (or, T or C), with a Healing Waters Trail, many art galleries, several exceptional eateries, a brewery, all wrapped in a folksy, funky, relaxing desert atmosphere. I like it here. It is wild, open country. I do however ride everyday—the girls are fit and receiving much attention from yours truly. It is rough, luring, rocky country with mesquite and creosote bush, and prickly pear cactus. Everything pricks and pokes at us. I follow sandy arroyos and climb jagged ravines only to be stunned by the vista. It’s all browns and tans, no color what so ever. The Rio Grande River runs through the east half of town and provides habitat for wildlife—mostly birds this adds birdsong color to the barren surroundings. My daily routine includes a half-hour soak at Indian Springs Bath Houses. Indian Springs must be one of the oldest spas in town. I chose it because the name reminds me these WERE indeed the American Indian’s hot springs. There is evidence that Native Americans have inhabited New Mexico for over 2,500 years. Early ancestral Indians lived for centuries as hunter-gatherers throughout the Southwest. About 1,500 years ago some of these groups, commonly referred to today as the Anasazi, began practicing agriculture and established permanent settlements, which are now known as pueblos. They used these natural hot springs as we do today, perhaps in a much more healing and spiritual way. Each night I step from my Ford, which parked out front of the spa looks like a scene from a movie. A gentleman appears at the door, his TV screen flashes brightly from inside. I say good-evening to him, he says good evening to me. He has a short gray neatly trimmed beard and a quiet voice. I hand him a five dollar bill, he says thank you very much, I say thank you very much. (We have not spoken much more than that, ever.) The wooden door to the soaking room is behind me and I turn and walk across roughly laid bricks into a cave-like space, into the earth. It smells of salt and water and earth. The space is small and nearly dark. The pool is small, about the size of a small hot tub. It is lined in stone and masonry. I melt, I float. Mostly, I do not think. Night-time temperatures freeze the water buckets while day-time temperatures warm me to the bones. “It’s a retirement community,” said the fire chief. I like it here. A small town with plenty of culture and amenities. On another note… I realize Martin Luther King, Jr.’s birthday has long passed, but I read these quotes in the Sierra County Sentinel. They are from the Truth or Consequences Middle School. I found these remarks touching. Most wanted peace and a clean environment. Will these young thoughts grow with them as they mature into adults? I wonder. Liska Pearl and I having lunch. Another story, “La Casa del Migrante” by Morgan Smith, “…Across the border, coming face to face with asylum seekers.” Being this close to the U.S./Mexico provides an entirely different view. While the topic of THE BORDER fuss and fume throughout our country, here, life goes on. One would think it was a war zone along the border after reading or listening to much of the national news. It does seem unfair, however, to have this level of luxury (well, for this lady long rider it is luxury), comfort, and security while so many struggle with enormous uncertainty. From what I read, these people are not coming here from Honduras and other Central American countries because they just damn well want to. They either leave or die. The countries from which they flee are cesspools of corruption, violent, and economically unstable to say the least. They have no desire to leave home, family, and community. These are desperate situations they are undertaking. A letter to the editor in the same newspaper, reminds us of the M.S. St. Louis, an ocean liner carrying 900 Jewish refugees to America in 1939, fleeing an impending war in Europe. They were turned away. Turned away from Cuba and Canada, and turned away from America under the guise of the “Quota Law of 1924.” Some found shelter in the Netherlands, France, and England, but 254 died in the Nazi gas chambers of Auschwitz. We must consider the implications of our actions. The world is a complicated place—I realize this. I realize there is no simple, one-sided answer. Not everyone wants peace, or fairness, or has empathy and understanding. But if we could solve the problems and bring peace to these countries that are crumbling in despair, people could and would not want to leave their homes. When I rode the border last year, I met nearly a hundred border patrol. Only two said a full-scale border wall would work. What then will we have with a wall? Refugee camps building up against the border wall as we see in other middle east countries? Like I said there is no simple answer. But lacking empathy is not the answer either. Umm, we shall see, seems like a big order. This is a very touching article Bernice wrote for the Central States Horseman online newsletter. Permission was given to re-post. I hope you love it as much as I do. Enjoy! The Holiday Season inevitably reminds me of my beloved gray Thoroughbred, Honor. Why? you might ask. Because Honor was a lesson in devotion, perseverance, and most of all kindness. She traveled with me nearly 11,000 miles. Her limitless, nervous energy challenged me every day. “She’s going to kill me,” were daily words that rang through my head for nearly eight months before she finally settled down. I purchased Honor from a horse trader in Washington state and prepared her for my second ride in 2006-2007, a 5000-mile ride, my hardest journey. I answered an ad in the paper and found her standing ankle deep in mud, shaking from a cold downpour of coastal rain, thin, wormy, and rain-rot down her back. “I’ll take her,” I said. Never rode her, never looked twice, never asked any questions. Wish I could have taken all the horses and knocked the guy in the head. She had papers which recorded her as having been raced in the southwest—won nothing; purchased as a dressage horse—too hot; then became a broodmare and had two foals, but became much too fierce and protective to have in a herd. She simply did not fit anywhere and I knew if she didn’t work with me this mare would end up for slaughter. She wanted nothing to do with me. She was literally crazy. At least by my standards, I had never worked with a horse like Honor. She had been bred for speed for cryin’ out loud. She rocked and spun circles in her stall, she was distraught and anxious. I moved in with her at the stable and two months later after much 24/7 work with her, a diet upgrade, worming, new shoes, and as much road work as I could possibly do with her, we set out on a 5000-mile, a two-year journey. How ever did we do it? I ask my self. Claire Dog offered her enormous companionship, she would follow Claire anywhere. Needless to say, this helped. From the northwest corner of Montana, we struggled across the great plains of Montana into the sweltering heat of North Dakota. Minnesota, where I stopped to visit family, nearly ate us alive with bugs. The ride south through Iowa, Nebraska, and Oklahoma were simply days and weeks of “getting by.” When I finally reached New Mexico we were exhausted—all of us—Claire Dog, Honor, and myself. But something else had happened. We had bonded! Shortly before Christmas, this scene unfolded. Honor’s behavior brought me to tears, as it will many readers who are of kindred spirits when it comes to horses. It was a common scene. Honor grazed 30 feet away while I sat in the brown grass with my arms wrapped around my knees. At my feet sat Claire on her hind-end, with her head up, stoically watching, listening, smelling. A sunny, warm, breezy afternoon passed slowly as I remembered the weather I’d avoided back in Montana this time of year. I’d reached my sister’s in Las Vegas, New Mexico a week before Christmas. This was a scheduled rest stop. From the right, I could see the neighbor Daryl West walking down the hill towards us with his two big shepherds, Bently and Maggie. I waved and said, “Come on over and visit.” As his two dogs moved closer to Claire, I could see Honor’s attention following them. Daryl said as he approached, “Be nice you two,” speaking quietly to his dogs. Our dogs were fine together–they’d met before. But the usual shuffle of dogs at first contact ensued. This brought Honor to our side, her head dropped, her nose now inches from the ground, and with a low deep nicker, she moved quickly but carefully. First, she nuzzled Claire, then my shoulder, before she pushed the two shepherds away. I never moved from my seated position. Daryl kept on talking as he stood a few feet to my left. Honor never laid her ears back, nor moved in a way that disturbed us. She went about all of this as if she were a careful mother tending to her young. Daryl never thought anything of it. Honor moved in such a quiet and careful way he never suspected her of doing anything. I held my breath, watching this horse offer protection—caring enough, careful enough, not to disturb anyone as I followed her every move with disbelief. Daryl talked, I nodded. As soon as the dogs tried again to move closer Honor moved in. She circled slowly, ever so slowly, round and round, until the two big dogs had no choice but to move further away. Daryl stayed, with his two dogs, for 20 minutes or so. Honor could have left at any time. We were in a large pasture, She was not tethered—no halter or rope on her, but she stayed with us. After Daryl and his dogs left, Honor resumed eating as if nothing had happened. We stayed there—the three of us in silent harmony, tears streaming down my cheeks. The hard struggles she had known in her past life had now led her down a road with a family. Dog, woman, and horse, united. This beautiful gray mare would make it, I thought. She would make it. We walked together back to the house through the still trees and at that moment, I loved her more than anything in the world. I’d never had a horse do something like this before–never. Honor, my beloved Honor, truly a lesson in devotion—devotion given, and devotion returning to me and Claire. For more photos of Honor and Claire which accompanied this article, go to the link below. It will open a tab with the Central States Horseman January newsletter. Bernice’s article is on pages 12 and 13 (click or scroll). Great Falls Tribune article, January 21, 2019. Excerpt and link to article, below. A retired teacher from Trego, Ende set out in 2005 to ride from northwestern Montana to New Mexico. She kept riding, putting 29,000 miles on her saddle and seeing the country (even the book tour for “Lady Long Rider” is by horseback). Eleven years later, she became the first person to ride ocean to ocean in both directions on the same journey, a trip she used to talk about the role suffragettes and previous lady long riders played in American history. Her goals are to learn, to explore, to grow and to encourage female leadership. This blog by the Montana Gift Corral features Bernice and “Lady Long Rider: Alone Across America on Horseback”. Exerpt below. On a small dairy farm just outside of Rogers, Minnesota a young girl grew up riding the wind and chasing her dreams. Bernice Ende was born to a knarl-handed dairy farmer and his wife, a woman who encouraged taking life by the reigns. Bernice grew up riding horses around the 100+ acres of land, imagining what it would be like to be riding through the wild west alongside the Lone Ranger and Hop-a-Long Cassidy. After Bernice was inspired by the grace of the horses, she went to Portland to study dance. From there she learned the Royal Academy of Dance method and went on to teach ballet for twenty-five years. In 1992 she moved to Trego, Montana where she opened up a dance school. Ten years later, Bernice Ende retired. However, retirement didn’t bring inactivity, it brought a window of opportunity. It was only after retiring Bernice felt the pull of the open road, the desire for adventure, the need to go, to see, to experience. 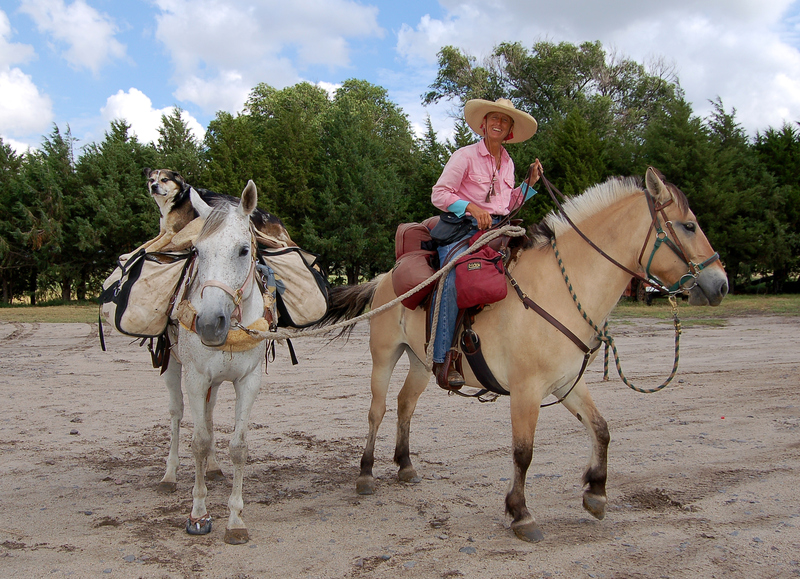 So in 2005, after an epiphany and a battle with her desires, Bernice Ende started a 2,000-mile journey on horseback. Since then, Bernice has logged more than 30,000 miles in the saddle. Her book, Lady Long Rider is a beautiful account of her journeys, her hardships, her hopes, and fears. If you want a raw and wonderful story, her’s is one I highly recommend. Honor and Essie Pearl near Sedona, AZ, heading east. 2008, 3000-mile ride. I suppose I should not admit it, but I am… running away. I remember running away when my mother, while in the hospital to have my younger brother, had been gone just a little too long for my 5-year-old heart. I was found not far down the country gravel road with my wagon and blanket. By now my sister must be quite tired of me, where I am staying here in Edgewood, NM. I’d planned on staying three days. Three weeks later I am preparing to leave, snow being the reason. But, three weeks well spent with my older sister and her friends–more talks and much rest. Honor and Claire Dog. 2006-2007, 5000-mile ride. I am half-way through the Lady Long Rider Book Tour. Half-way! Four months ago I looked south on my map with trepidation. I am taking THAT (eyes upon my 50-year-old ’69 Ford, a truck that has scarcely been out of Montana!) on this book tour? But here we are, Bill’s Old Blue Truck having gallantly pulled my girls up and over the mountains of Montana into the green of Washington and across the plains and rolling hills of Oregon. We followed the east side of the Sierra Nevada’s south then eastward over the flatland of the Mojave Desert and finally, my loyal Ford conquered the high town of Flagstaff before dipping south through Silver City, and arriving in Albuquerque three weeks ago. My faithful companion Claire Dog. Her first year riding, 2008. A tar-paper shack will a million-dollar view. Caught in snowstorm after snowstorm. I’ve decided to forgo Texas until the documentary is completed, when there’ll be more time for the big state. We have been doing much additional filming while I’ve been here. I also look at a serious need for a break and time to ride. Thus comes, a “Run Away”. Cowboys, end of day. Ranch north of Magdalene, NM. 2007. I return and begin the second half of the book tour on February 15th. Sunshine, miles of open road, the absence of cell phone and computer. The horses and tent await me. A sincere heartfelt “Thank You” to all who have hosted a talk or who have responded with kind words after reading the book, Lady Long Rider. To all of those who have traveled miles to hear my words and stories. Thank you to those who have helped coordinate the presentations. And thank you, thank you, to my publisher, FarCounry Press, for the support you offer. Long straight roads across New Mexico. 2006. Sarah Wilson and Zach from FarCountry Press will be holding the reins while I am riding. I will continue sending book and DVD orders and will check in with Sarah once a week.